Replace a worn out head on your Ultimate String Mop or order extras for convenience sake. This is a revolutionary mop head that combines the cleaning power of microfiber with the absorption ability of a synthetic shammy. It is more absorbent than any other available, and thanks to the high quality microfiber fabric, it cleans with only water. Use it with your favorite cleaner if you want, but the unique weave of the fabric allows it to clean without chemicals. You will be able to remove 99% of all dirt and germs with only water added. It will hold 47 times more liquid than a traditional cotton mop, but it also dries faster so it won't stink or grow mildew like they do. It is extremely hygienic and can even be used in clean room applications. This head is machine washable for hundreds of applications, but after extended use, will need to be replaced. Clean your floors faster, easier and safer. Mop handle sold separately. Use as a replacement head, or pair with any standard pole to create your own powerful cleaning tool. The material that this part is made from is safe for any flooring surface. It will never scratch or leave marks of any kind, but it will thoroughly clean any floor type you use it on. The specialized material is able to be gentle on flooring surfaces and special finishes, but tough on dirt at the same time. Gently skim the surface while picking up and removing every last spec of dirt, germs and other grime. Use on hardwood, linoleum, tile, granite, marble, ceramic and more. No surface is too delicate, and no dirt is too caked on. Using just water alone, this powerful mop head will eliminate dirt and soak up spills with ease. This is the environmentally friendly way to clean your floors and keep them safe for children and pets. It also works great for cleaning up spills, leaks or puddles. Order Yours Today! Dimensions (l x w) 13" x 3"
Replacement String Mop Head - Replace your lost or worn out string mop head. Order several for reduced pricing. This is the best mop I have ever had and thats why I ordered the refill. I try to stay ahead by one in case this ever goes out of stock. Truly the ultimate string mop. This mop is the best for any type floor. I’ve had the mop and just ordered the replacement mop heads! Good mop. Took a bit long to arrive but finally here. I love this mop & I am so glad I found it on your site. They have improved this mop by making it thicker & longer. Will always use this mop. Absolutely love this mop! It's the best mop. The microfiber mop head is great!! Perfect for laminate floors. I had been looking for this type. Of mop for a long time, it was exactly what I once had, but less expensive, a nice surprise! These last quite a long time before they look thin and wispy. They ring out well and really do a great job. Regular sponge mops leave a residue line but these are just excellent. Don't put them in the washer though. I found that they strands unravel. You are better off doing a quick rinse in some mild bleach water and storing upside down in between uses. I've bought these mops for several years and use them for my cleaning service!! The last few orders I've made there have been a few mops that haven't been made good. They are tearing, falling apart because the plastic fastener isn't attached properly, and some just on the skinny side. Is there a way to get these replaced when I'm having issues? I love these mops but not happy that I'm spending money and some aren't as good quality. Overall these mops are awesome. Quality control needs improvement. simplygoodstuff response: Sorry to hear this. We do stand behind the quality and effectiveness of this product. Please give us a call with your order number. We would be happy to replace any defective heads you received. I love the microfiber mop. I'VE brought it a few times in the last six or so years. Easy to mop . Leaves no lint on the floor. Very happy. Works nice.easier than the older string mops,lighter. this mop has been my favorite for a few years now. It is super absorbent and leaves no streaks when mopping my hardwood floors. I toss it in the laundry and reuse over and over. I never put in the dryer. Just wash, run fingers thru to untangle and hang to dry. I love this mop and so do my customers. Have been selling for years. Streakfree4u. Very happy with this mop! I have a small cleaning business and this mop does a great job on floors. I especially like it on hardwood/laminate flooring. It wrings out easily and is very lightweight.I like the fact that it screws on to an existing pole that I already have. I do recommend if cleaning it in the washing machine to put it in a mesh bag and launder separate. Comes out great! I will be ordering more of these in the future. Love this mop.... the best I have ever used. Washes well in a lingerie bag. It lasts a long time too. Definitely a find. You won't be disappointed. You can buy the replacement mops,and don't have to buy the whole thing. This is the best mop ever!!! I am running a cleaning company and found this mop leaves no marks and does not loose any strings at all. Can be used on all floors. And just put it in the washer it is ready to go the next day. I do like the mop heads although I think they are getting a little pricey. Not sure if I will order more. This is a great mophead! We use it in our business on all kinds of floors (vinyl, wood, tile, etc) and they are great on all of them. They wash well, hold up really well. They aren't cheap, but over the long run, their durability has made mopping FUN! The best mop ever. I don't sweep the floor before I mop. The mop cleans and sweeps in one. The floors gets really clean. Love microfiber material--rinses easily and not difficult to wring dry; however, mop head is skimpy on amount of strings/material. Have to be very careful not to scrape floor with plastic head that holds strings. yes, received it Saturday, thank you, happy to get my mop heads! Great mop head. Never thought I'd be buying such a thing on the internet! I have a housekeeping business and find this to be the best mop I have ever used. This is my second order I purchased 6 mop heads this time. Everyone I clean for remarks on how amazing their floors look now that I use these mop. I also use it at home. Keep this product in stock simply good stuff Ill be ordering again soon. This is my second time to order this mop head! It is lightweight, easy to use, effective and machine washable!!! Good for daily home cleaning. I have been using a string mop for several years and loved it. I bought this one to replace that one and found this to be the BEST mop ever. It holds so much water allowing me to get a lot of water onto the floor, and it soaks up really well so the floors dry much faster! I would recommend this mop to everyone!! I was disappointed when I washed the mophead in the washer in a lingerie bag, like I have always done. The strings frayed and were a mess after it came out. I love the mops, but has somrthing changed? simplygoodstuff response: Nothing has changed, so you may have a defective head. If your recent purchase is not the same quality as previous ones, please give us a call so that we can help. I have been ordering these for 2 years. They clean very well. I will continue to order as long as they keep making them. 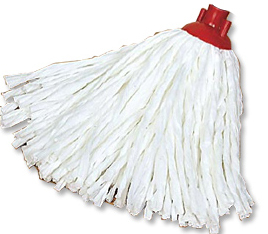 I have a cleaning business and I recently ordered this mop. EXCELLENT mop. Gets the dirt up. Love that it doesn't have the loops that can catch on to furniture. Holds up really well. what is the length of the strings? Is this a socket type of screw on head I can use on my existing pole? Yes. You can use a pole you already have. It just screws on, and the thread is pretty standard. String length is about 12"
I thought I saw at the bottom of a page there were two different sizes of this string mop, but I can't find them again. One was 6oz and the other maybe 8oz? Is there another size? Thanks in advance. This mop is only available in one size. I like that it is white with a steel pole; this gives a blend-in effect instead of all the garish colours out there that clash with the cabinetry and the price is right. How long do the mop heads last and are they available in retail stores? You won't find this mop in stores locally, and the durable heads are totally washable and reusable. Exact lifetime will vary based on how frequent they get used, what cleansers are used with them, and what type of floor is being mopped, but most customers find that they last a long time. A Chenille Pad For Your Microfiber Mop. Use Wet or Dry.